Members of the rotating ensemble cast of <em>The Bald Soprano</em> in the roles of Mr. and Mrs. Martin. 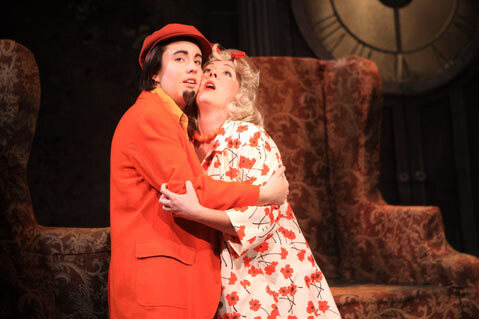 Eugne Ionesco’s one-act masterpiece The Bald Soprano delivers enlightened and thoroughly addled hilarity in the hands of director Mitchell Thomas and an enthusiastic cast of Westmont theater students. Ionesco perfected the genre of the sketch about non-communication exemplified in such classic vaudeville routines as Who’s On First? In this instance, two very different yet disturbingly similar British couples, the Smiths and the Martins, meet and discuss things until they are interrupted either by the Smith’s maid (Marie Ponce) or the fire captain (Sam Martin). In one sequence, the Smiths put a lot of energy into working out the complexities of the relationships within a rather large clan of people-husbands and wives, fathers and sons, mothers, daughters, uncles, nieces, and grandmothers-all of whom happen to be named Bobby Watson. For the Martins, the stakes are higher, as they must reconstruct, through a large number of truly “baffling” coincidences, that they do in fact know one another, and that they actually are husband and wife. This arduous process of question and answer holds remarkably little weight in the ensuing action however, and it’s not long before Mrs. Smith dismisses the notion entirely. To praise individual performances in this production is a bit more challenging than usual, as the members of the cast rotate through the various roles for the duration of the run, changing places for every new full performance. With prodigious use of costumes and makeup, young men act the parts of middle-aged women, and young women act as their husbands. The ingenious set design by Martyn Bookwalter uses four significantly oversized armchairs to great effect, and succeeds in sending up the complacency of the English sitting room. The entire cast-Brittany Chaco, Jessie Drake, Spencer Fox, Sam Martin, Hannah Rae Moore, Jessica Papp, Marie Ponce, and Shawnee Witt-give vigorous life and nuanced readings to the show’s challenging dialogue, which becomes increasingly more unhinged as the night wears on. A special Halloween-night marathon, in which the show will be done every 90 minutes all night long with the cast constantly rotating, should be a genuine treat.